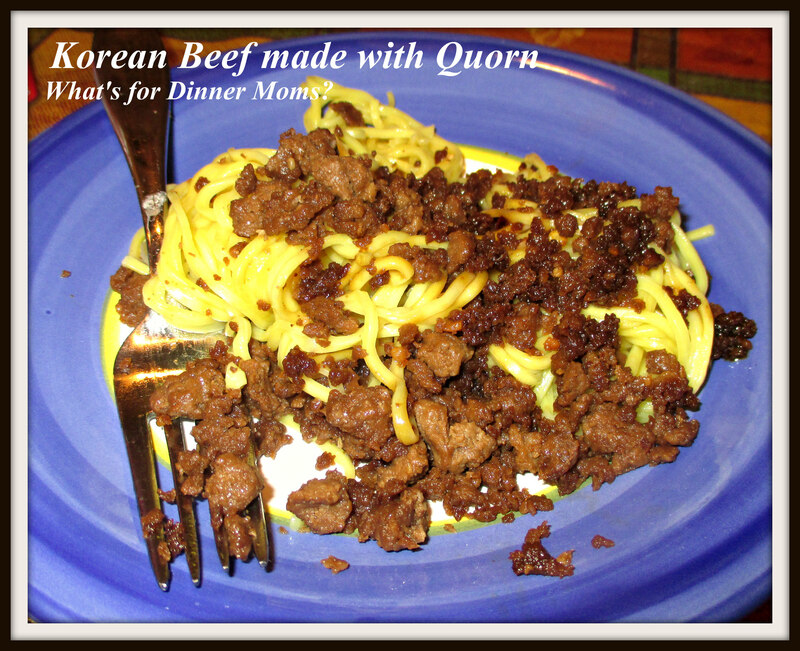 Korean Beef made with Quorn – What's for Dinner Moms? I purchased this product with my own money. I am not in any way affiliated with Quorn. These thoughts and opinions are my own. Quorn is something I had never heard of until my son decided he wanted to become a vegetarian. I was searching for a meat substitute to use once in a while someone suggested we try this because my son is not a fan of soy products. I don’t want to use meat substitutes very often but once in a while they are a meal lifesaver. Quorn was on sale at the grocery store a few weeks ago so I decided to try it. Since the website said that it absorbs the flavors of what you cook it with (similar to textured vegetable protein) I decided to try something a bit spicy to see if it would hold true. We loved this! I thought it was far better than the Textured Vegetable Protein (TVP) we tried a few weeks ago. There was only the taste of the Spicy Beef Sauce. There was no other flavor or aftertaste. Even my daughter was surprised to find out she was not eating ground beef. She asked that we use Quorn again when making other dishes. We definitely will. This recipe is on the table in under 20 minutes. Chow Mein noodles take about 3 minutes to cook so when you are adding your sauce to the “beef” put your noodles in the boiling water and both will be done about the same time. All four of us had 2 smallish servings and we still had enough leftover for 2 lunch servings the next day. I served this with a side of broccoli and sliced red peppers. Heat vegetable oil in a large skillet over medium heat. Add garlic and cook, stirring constantly, until fragrant, about 1 minute. Add Quron and cook until thawed and heated through, about 5 minutes. Stir in soy sauce mixture until well combined, allowing to simmer until heated through, about 2 minutes. How clever! I love Quorn. There is so much you can do with it. Thank you! It has definitely moved up my list for dinner! So simple.